Dual Everest champ Redzel is a much bigger boy in 2019 than usual at the start of a campaign. 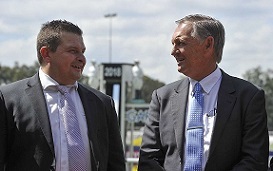 Trainer Peter Snowden said he wouldn’t have it any other way as the six-year-old starts what will be a another long autumn including at least one interstate trip. Redzel is due to have the first of two barrier trials at Randwick on February 7 ahead of his defence of the Group 2 Challenge Stakes (1000m) a month later. “He always comes in with plenty of condition on and that gives you plenty to work with,’’ Snowden said. “He's a bit heavier than normal but I don't mind that because he has a fairly long preparation. The winner of over $15m in prizemoney has been back in work about six weeks and though Snowden said you never take things for granted with racehorses Redzel is pretty easy work. Of course Redzel threw a scare among his connections in the lead up to the 2018 Everest when he had to miss The Shorts following a stable accident on the morning of the race. It’s just a small reminder that mishaps can happen but once he’s on the track Snowden said he’s all tradesman. “One thing I’ve learned about horses is you can never guarantee anything but he's just such a genuine horse,’’ he said. “You know he's going to give you everything, he never holds back and that's a big key factor to have in any horse. Redzel will have two starts prior to seeking the upper hand in his battle with Trapeze Artist in the Group 1 $2.5m TJ Smith Stakes (1200m) on April 6. The pair have met twice over the Randwick 1200m – Trapeze Artist ran Redzel down to win the TJ on Day 1 of The Championships last year before the placings were reversed in The Everest. After the Challenge Stakes, Snowden said the handicapper will decide whether Redzel runs in the Group 1 $700,000 The Galaxy (1100m) at Rosehill on March 23 or the Group 1 William Reid Stakes (1200m) at Moonee Valley the night before. Prior to winning two Everests and a couple of Group 1s Redzel (with 54.5kg) ran second in the 2017 Galaxy to stablemate Russian Revolution but Snowden knows he’ll be top weight if he runs this year. He said The Galaxy provides an ideal 1000m, 1100m, 1200m progression through the preparation. “I'd sooner run here but it depends what weight he gets,’’ he said. Redzel is currently rated 120, last year’s Galaxy top weight Le Romain (58kg) was rated 114, which is 3kg inferior, suggesting 61kg is around the weight he can expect. It's expected the gelding will end his campaign in the Doomben 10,000 before being set for an attempt at a third Everest in October.